This cleanser is absolutely delish. It does an expert job at cleansing, removing makeup and enhancing the texture of your skin. It has both Glycolic and Salicylic Acids as well as brightening agents to give you fresh, glowing, conditioned skin. It’s great for dry, normal, oily or sun damaged skin types. However, it’s not recommended for ultra sensitive skin. Removes Makeup – Like the GlamGlow SuperCleanse Daily Clearing Cleanser I reviewed last week, this cleanser also does the job when it comes to completely removing your makeup. I can’t say the same for many other cleansers I’ve tried. As I mentioned last week, I hate having to use a separate makeup remover. With this beauty of a cleanser, There isn’t any makeup residue on the towel when patting my face dry. 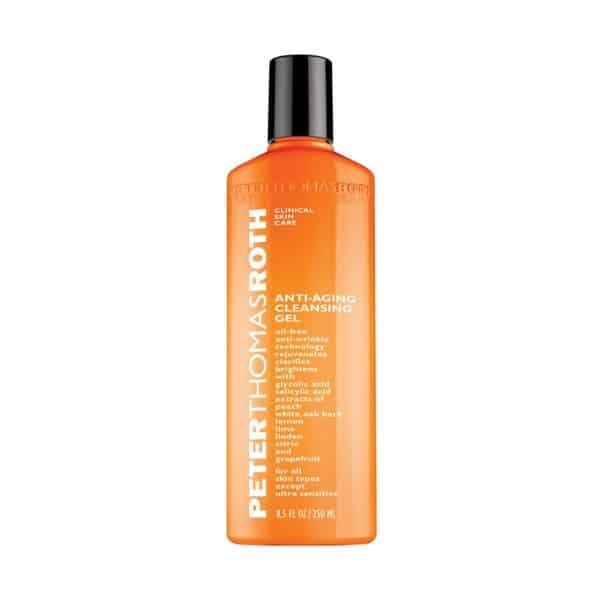 Well done, Peter Thomas Roth. Soft Skin – This product leaves my skin so super soft. It definitely feels cushy, clean and fresh. I love it. Anti Aging Benefits are TBD – I’ve been using this cleanser on and off for a while, and haven’t really noticed any significant anti-aging benefits like a diminishing of fine lines or wrinkles. It does leave your skin feeling very supple and fresh, so in that aspect, it does give you a more youthful feel. Granted, I definitely haven’t used it consistently enough to have a valid argument one way or another with regards to it’s wrinkle fighting capabilities. Overall, I didn’t buy it for it’s anti-aging properties. I bought it because I wanted a good cleanser that did it’s job, so this isn’t a deal breaker for me. No Pump – The travel sized container has a screw on lid and the full sized product has a press down tab. Ugh. That’s my ONLY complaint about this wonderful product. I wish they had a pump dispenser so that I could set it on my counter and not have to pick it up and turn it upside down each time. I know, I know, first world problems, right? This small flaw is easy to get past and so I gave the product 4 stars. If you’re looking for a great cleanser, this is definitely one to try. I feel like this product is too harsh on my skin.